Chico Bouchiki, alias Chico founded the hugely successful Gypsy Kings then set up Chico & The Gypsies. Chico’s story is remarkable, sometimes triumphant, sometimes tragic. A story of being in a certain place at a certain time. From a Gypsy to a Special Envoy For Peace with UNESCO. Through his own Bouchiki family he came in contact with the children of the most famous gypsy in Arles, France, namely Jose Reyes. Like all gypsies, Jose Reyes lived in a caravan and camped in the Bouchiki’s neighborhood. His exceptional voice had made him one of the most famous gypsies in France and throughout the World. His only rival in talent and renown was non other than his cousin, the famous guitarist Manitas De Plata. Jose and Manitas were already playing together in some of the most prestigious venues in the world when Chico came into their lives. “Just by being with them, I picked up a guitar when I was 17 and started to play. It was gift from heaven. I found I had rhythm and started to play with all the other children who played guitar. In the beginning I had no thoughts about making music my career. We were just having fun.”. “Los Reyes” was formed and became the favourite of many famous stars like Brigitte Bardot. Chico’s best encounter was with “Charlie Chaplin”; it helped him hang on to a dream… With “Los Reyes”, he discovered his vocation as a musician and composer. He was also to be their manager, their spokesman and the person who looked after every last detail of their daily lives. 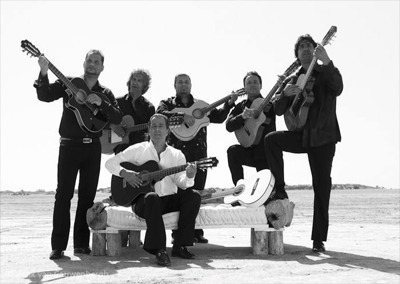 In 1983, confident of the groups success, Chico renamed the group from “Los Reyes” to “The Gypsy Kings” . “I was convinced about the worldwide appeal of our music and we needed a passport to success, hence the new name.”. Unfortunately some record producers did not agree and it threatened the band’s existance but Chico was sure the band would be the success and worked even harder. 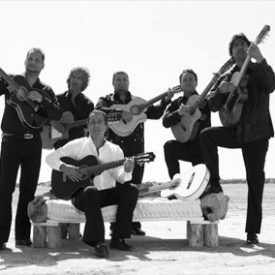 Eventually The Gypsy Kings were signed to a record label and in 1989 they sold 3 million albums and were destined to receive 15 Gold Discs. They gave their first Gold Disc to Jeanne Calmant, a doyen of humanity who died last year aged 122. After a time, Chico ran into problems. The group had been managed since 1986 by Claude Matinez but Chico and Claude fell out in 1991 and Chico decided to leave the group. Chico is an optimist and life has been good for him. He has known hard times and 1991 was a very bad year for him. He lost his Baby, his Father and The Gypsy Kings. He survived these blows of fate and started again with renewed strength… a new start… he formed Chico & The Gypsies with younger musicians from Arles and Montpelier. As Producer and Artistic Director he is re-creating the music of the past hits and is writing new songs, still with a Gypsy flavour but more influenced by the wide variety of Romany music than before. Whereas he was the originator of the Middle Eastern sounds in The Gypsy Kings hits, he now embraces his Oriental side. The first album by Chico & The Gypies “Vagabundo” sold over 200,000 albums on top of singles sales. The second album “Nomade” featured Chico’s interpretation of some of the old Gypsy Kings hits alongside excellent new material and is still selling well. The third album “Freedom” is now being released worldwide and is forecasted to bring the band the worldwide success they deserve. As a protector of Gypsy culture, Chico has set up the “El Patio” Centre for all the world’s gypsy travellers to meet. It is a festival ground that includes a Bodega, a Grange, Arenas, Caravans and a spectacular view over the river Rhone. Among gypsies, music is handed down from Father to Son. It is the only inheritance parents have to give and the only homage that children can make to their gypsy culture and to their families. “Jose passed the flame to me, you could say he saw me as his successor.”.